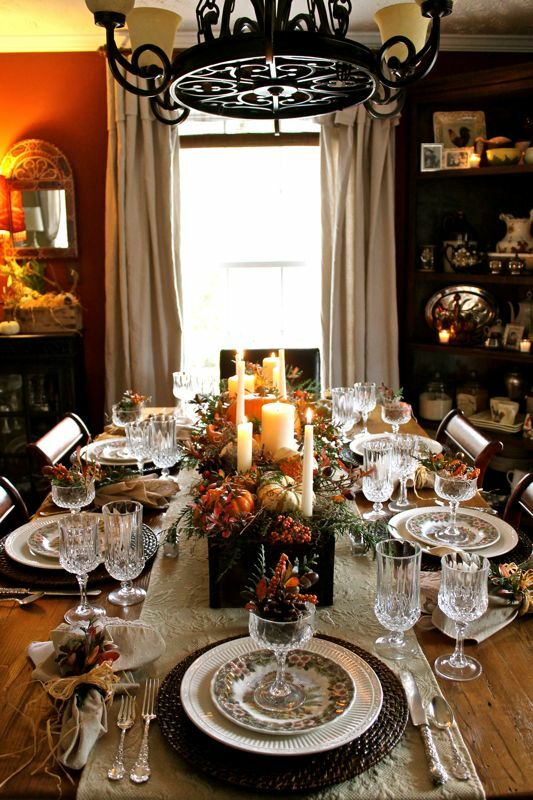 What would have been the exact same Thanksgiving table as last year totally took a different turn thanks to a photo on Pinterest! If you did not see the whole inspiration process, you can see it HERE. 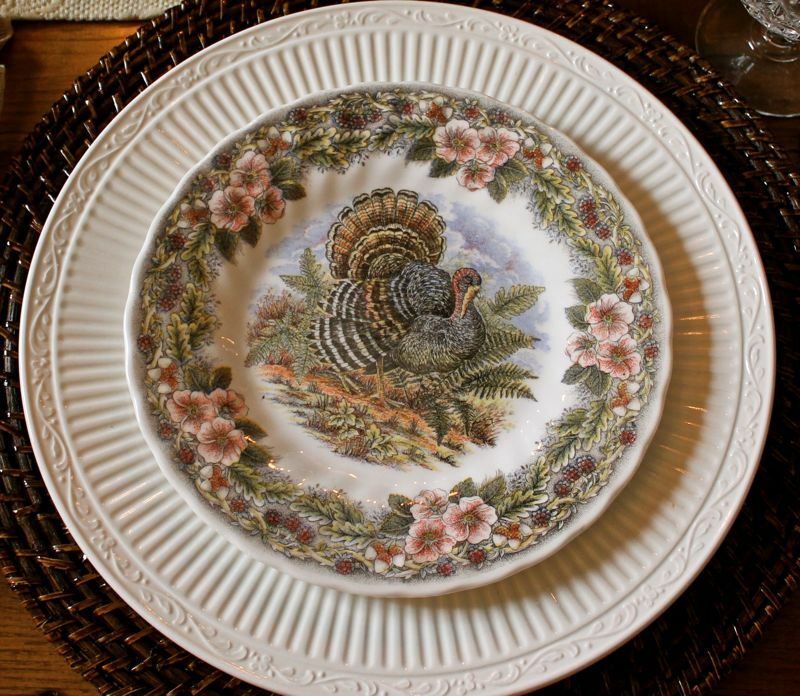 I used a Mikasa "Italian Countryside" dinnerplate with a Myott Churchill "Thanksgiving Turkey" salad plate. I really do love this turkey pattern best -- probably because of the soft, muted colors. The crystal is Durand Cris D'Arques "Longchamp" and I have filled the sherbet glass with different natural elements including arborvitae, azalea leaves, berries, acorns, pinecones and moss. I paired a vintage crochet edge napkin with a taffeta napkin and bamboo napkin rings wrapped with raffia and accented with greenery. 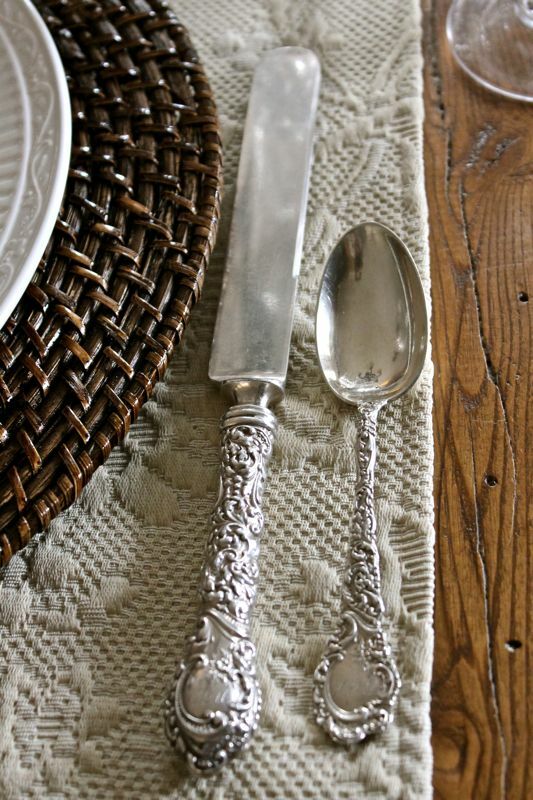 I love the way the sterling silver flatware looks next to the bamboo charger and the rustic wood of the table. This is an antique pattern by R.S. Wallace and Sons from 1893 called, "Louvre." 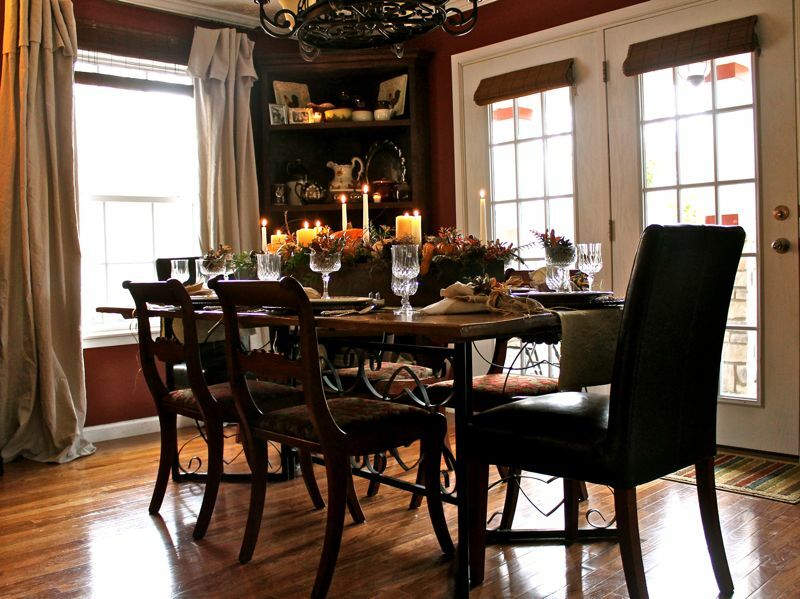 Love the darker color especially with the medium tone of the table and the creamy matelasse runner. I added some azalea branches to the box because I loved the colors the leaves have all turned now. 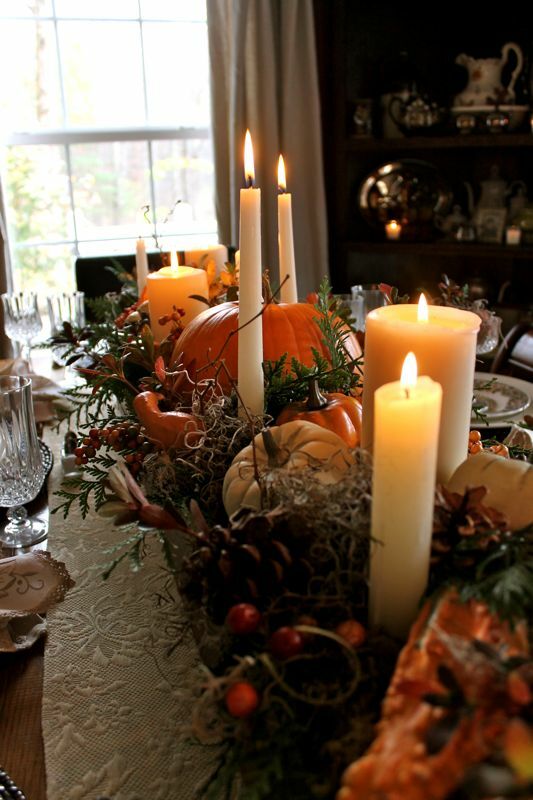 I know it's the middle of the afternoon, but we will have the candles lit during our Thanksgiving meal, which is usually early afternoon. 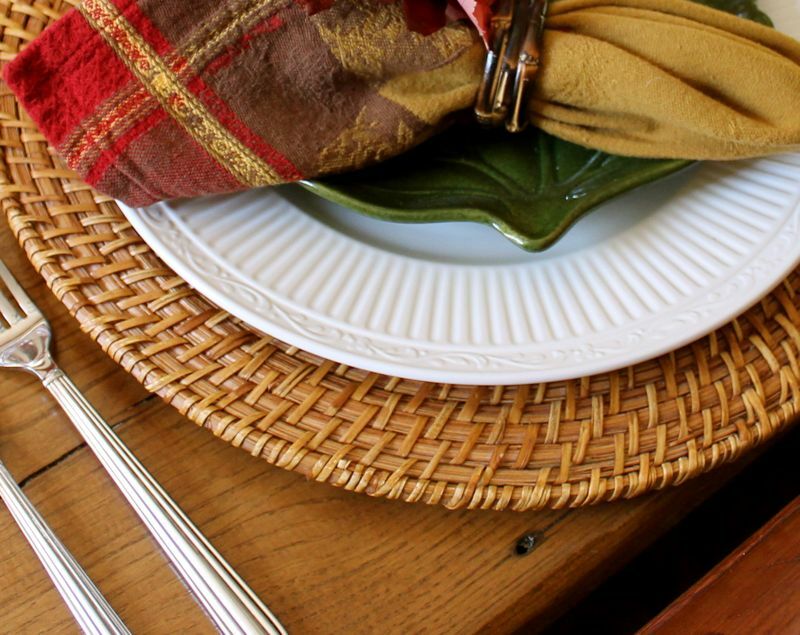 So there you have it -- my 'new' Thanksgiving table using everything old. I hope I have inspired you to gather what you have inside and outside the house and reuse in a different way. Everything on this table was something I had here or repurposed in some way. I really do appreciate your stopping by! And a heartfelt welcome goes out to my new followers:-) I'm getting around to everyone slowly but surely. 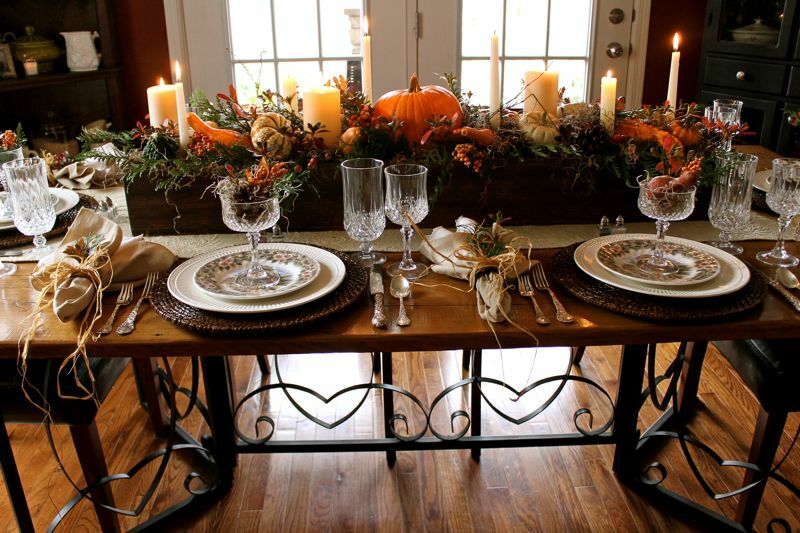 This is truly a gorgeous, "rustic elegant" table! It's just breathtaking. I read your earlier post about the box your husband made and you stained. Don't you love finding visual inspirations like that? 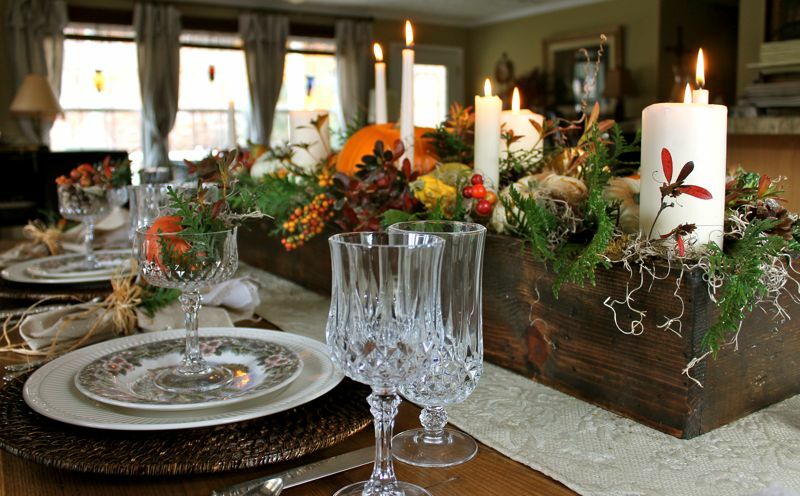 I love all the elements on your table and particularly the turkey plates. The colors are really nice. 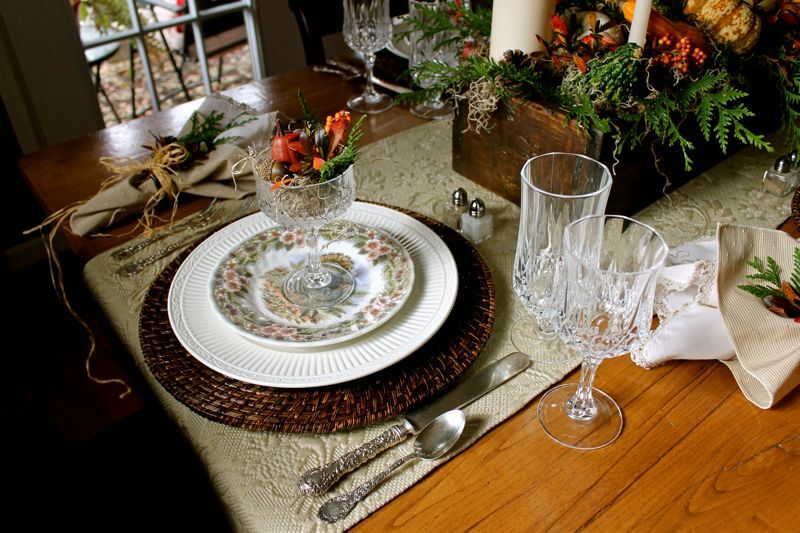 I never knew how many turkey dishes were out there until I started tablescaping. :) Thanks for sharing and have a great week. Ohhh la la my friend, just divine :) love your gorgeous silver ware :) and those beautiful plates!!! what a truly magnificent table setting!!! Anita, I just love absolutely EVERYTHING about this table! You have done an amazing job! 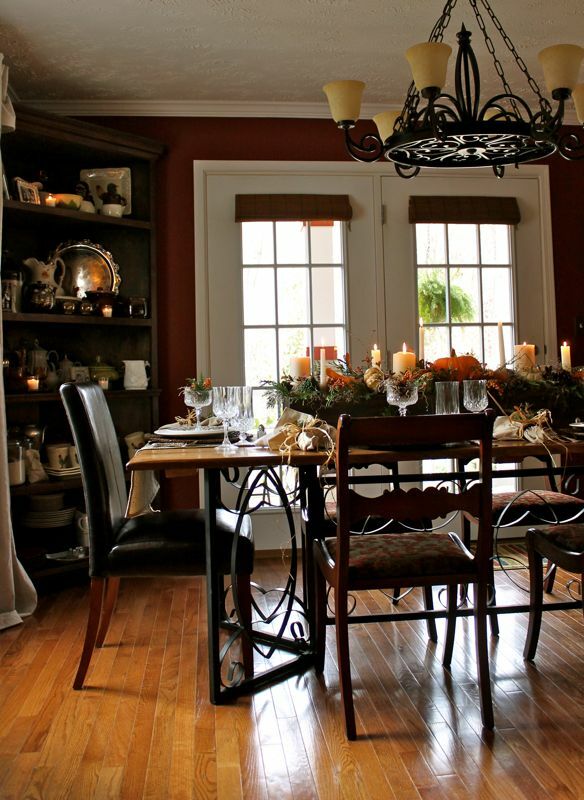 The mix of elements is just stunning; and your turkey plates are the icing on the cake! Absolute perfection! Anita, Your table is so pretty.Everything compliments each other.Beautiful. Oh my!!! that box your husband made is wonderful! You really took it to the next level! I have the same turkey plates in the brown...great minds think alike! Just love your tables!!!!!!!!!!!!!! Beautiful! My mom just surprised me with a setting for 12 in Italian Countryside! I can't wait and I have those chargers. I might try to stain two dark because I have 4 dark and 8 light. What a great idea! Your table is beautiful and I love the crystal and silver with all your outdoor organic touches! Happy Thanksgiving to you and your family. Anita, your table is gorgeous! Your centerpiece is so amazing. Anita, just one of your best. Each table top out does the other!I have learned so much Anita from your blog. I love the rustic elegant look and the silver with wood. 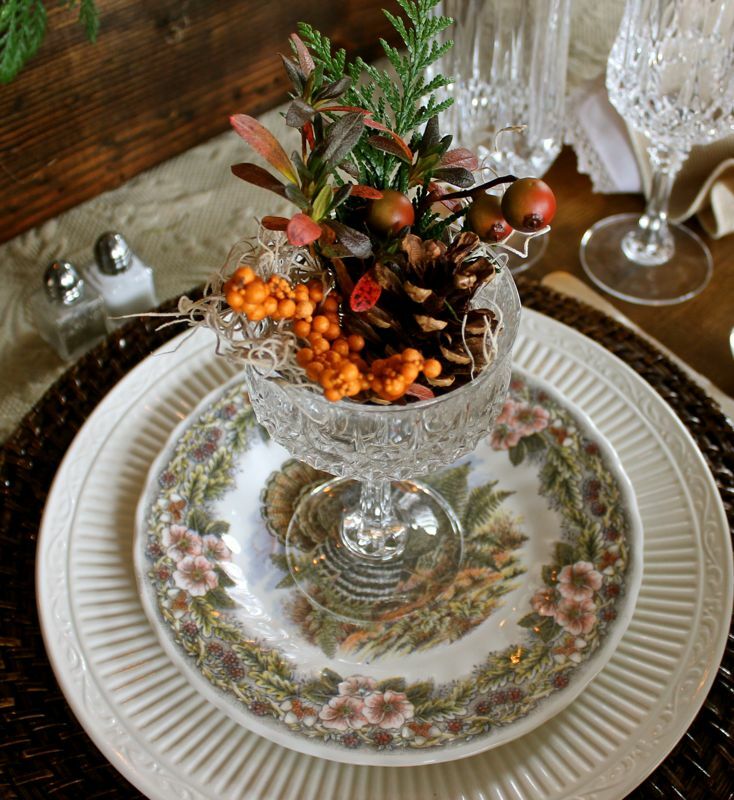 The centerpiece is stunning.You have out done Victoria Classic magazine and Southern Lady. Blessings of Thanksgiving to you and your loved ones. stop by and visit again soon.. This is my favorite table of any you have done, Anita...it has to be that fabulous rustic box your husband made for you. Thanks for sharing. That is such a gorgeous table! You've done an outstanding job. What a great idea to Minwax those bad boys!!! It is hard to find what we want in the right color sometimes, so the only way to fix it is to pull out the ol' paint! Capital idea!!! The whole table is the picture of absolute elegance! I love the flatware...it has such a rich look to it. I think it would feel good in one's hand. Bravo, Anita!!! You make the prettiest tablescapes, Anita! This one is just beautiful! You are going to get many compliments!! I love this table!! You had me from the wonderful wooden box and kept me right through to the sherbets. I'm so glad that I finally figured out this pinterest thing. Now, I can save this and remember who gave me the inspiration. Really, Anita, I think it's beautiful. Wow! This is super duper lovely! That table should win an award. I am serious. 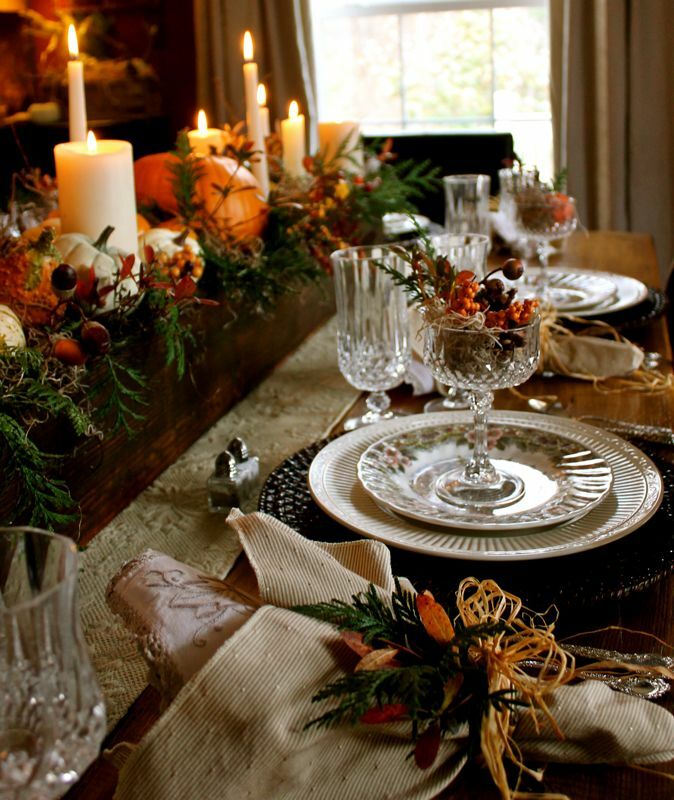 That is one of the most beautiful tablescapes I have seen. I love the chargers stained darker. Makes it so elegant and the Mikasa plates. Oh my word... stunning!!! Wow, the sky's the limit for what you can create with that wonderful box! Your fall is creation is just beautiful. LOVE all the natural colors and textures you used. Great idea on the chargers--I had thought about trying that and I'm glad it works! Thanks for sharing your stunning table! Hope you and your family have a very Happy Thanksgiving. That centerpiece is truly a work of ART!!! Love all the elements in and on it - simply stunning! 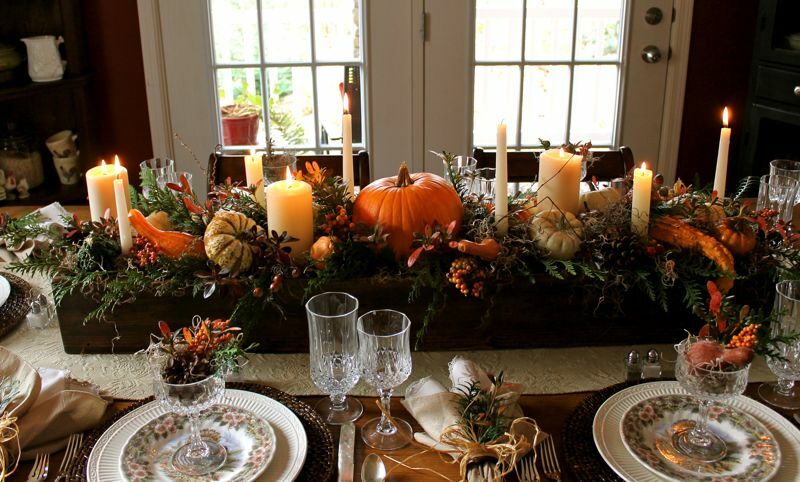 The tablescape looks lovely... !!! Love the turkey salad plate- soo... Its beautiful !!! 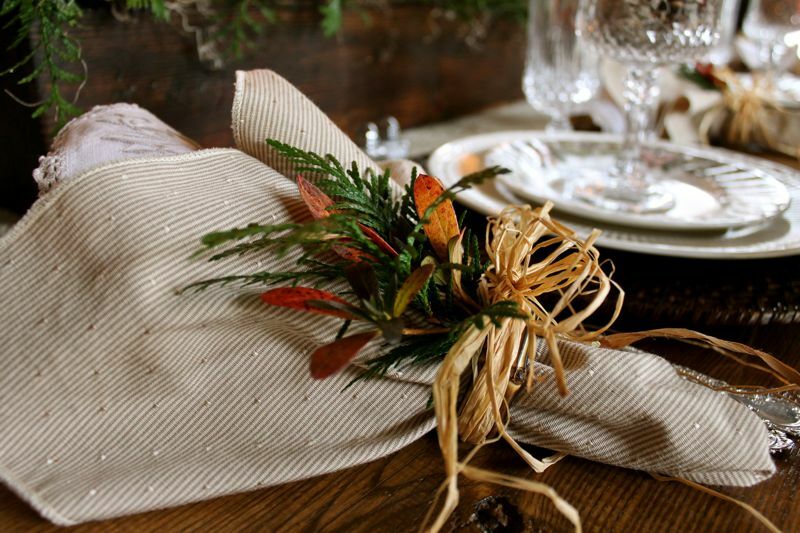 Love the way you have placed the leaves above the napkin rings... Looks gorgeous !! That centerpiece is stunning! I wanted to do something similar and am just waiting to find an oblong box like or similar to yours. Everything is set so beautifully! 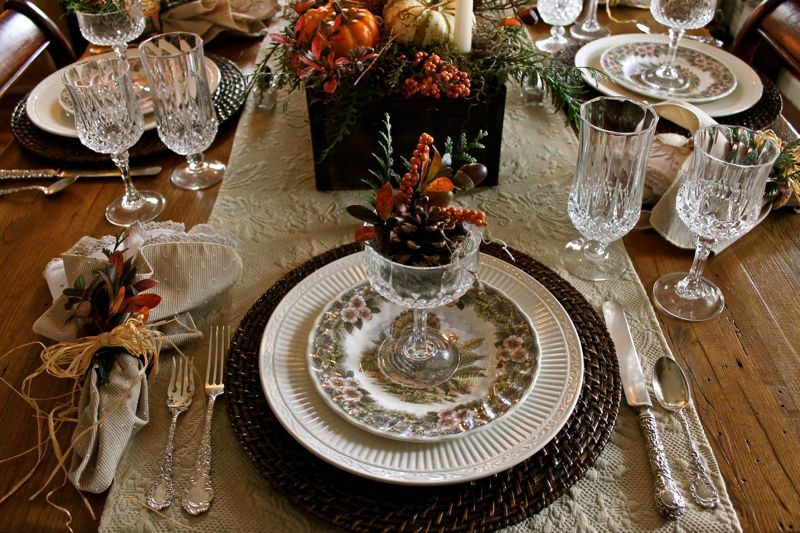 Absolutely EVERYTHING is gorgeous, from those fantastic turkey china plates, to the napkins, to the silverware, to your gorgeous center arrangement. A feast for all the senses! 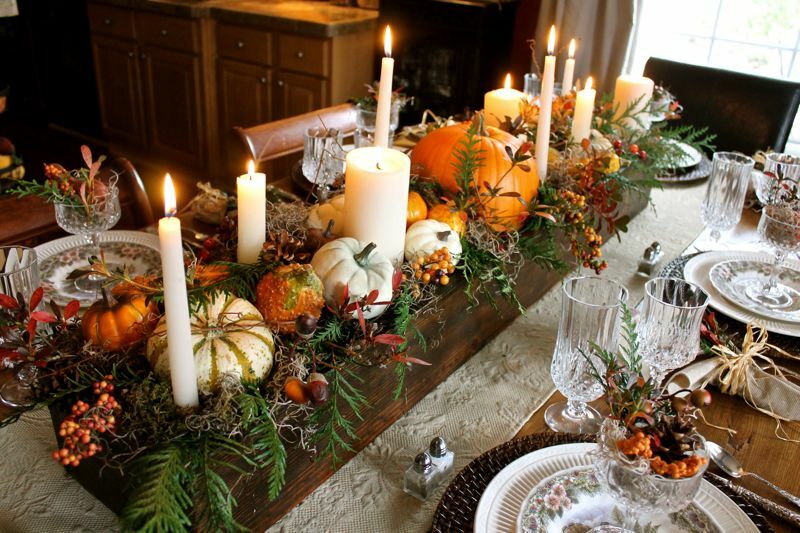 I am totally in love with this tablescape; it is stunning! You have filled your new centerpiece box with the most beautiful arrangement. I love how you stained your chargers darker; what a great idea! Anita, you have done a fabulous job with this setting. Love, love, love it. I'm glad I found your blog through TT! I love the box that your husband made, and am inspired to use my azalea branches for my Thanksgiving centerpiece this year. After perusing a few posts on your blog, I have decided to become a follower. I know I will enjoy my visits to Far Above Rubies! I found your blog through TT at BNOTP. I am so glad that I did, this table is amazing! My favorite (which was hard to narrow down) is the box your husband made. What a meaningful table! Anita, Your table is stunning! I love the mix of rustic and elegant. Your husband did a great job on the box and you filled it perfectly. It's so funny, because my husband made a box for me to use for Thanksgiving, but I haven't stained it yet. Our table is very narrow and I was having trouble finding something to go in the center so he made the long box. Thanks for the inspiration for ways to arrange the filler. Have a great Sunday. WOW Anita, this has to be your finest table ever. I always seem to think that, and even say it, but then you go and outdo yourself again. It is just gorgeous. 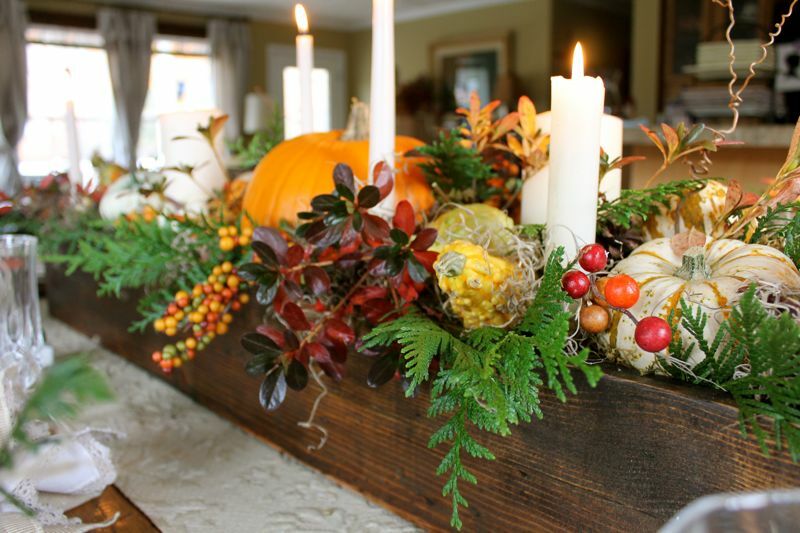 I love the centerpiece so much that your husband made for you. You always inspire me, Anita! This is gorgeous. Beautiful! You are so clever! Hi Anita! We are still making our way through last week's links and I just wanted to tell you how absolutely gorgeous I think this is...as in, my mouth dropped open! :-) You have such a gift, my friend, and this perfectly captures all of the best of Autumn to me. Thank you so much for sharing it with us at Inspiration Friday last weekend! 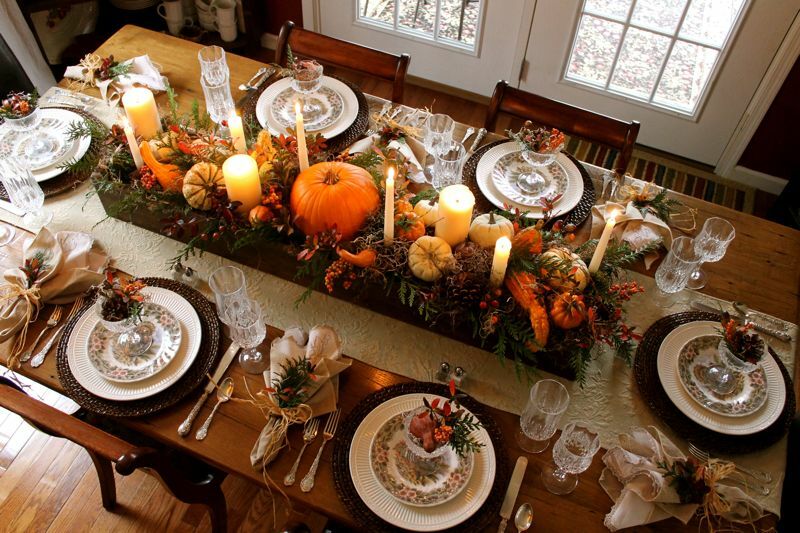 That is, by far and without a doubt, the most beautiful Thanksgiving table I have ever seen. Kudos to you! You are so very creative. I'm sure glad I found you. Wow Anita! That is one gorgeous table! The colors are rich and that centerpiece box is awesome! The matelasse adds a great texture and looks perfect with your new box! You did an outstanding job on decorating it! So charming~ what a beautiful table!!! Thanks so much for sharing at Feathered Nest Friday! Hi Anita ... Love the long box with all the candles. Beautiful table. Thanks for sharing. I am a new blogger and learning so much. Hope you will visit me at Timeless Treasures. Thanksgiving Blessings. Oh my goodness! 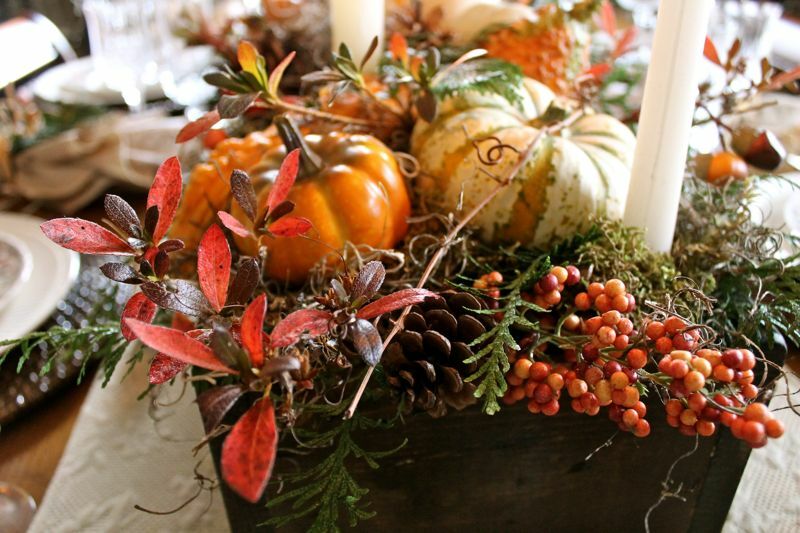 Your table centerpiece is truly one of the prettiest that I've ever seen. I love the box going down the center filled with all the Fall bounty and candles. Every little detail has been done perfectly. I know that your family is going to treasure sitting at your beautiful table! Beautiful table, I love the box arrangement. I do love those turkey salad plates too. Hope you had a wonderful Thanksgiving. You have created a masterpiece. Love it. God bless and may you have a wonderful Holiday Month. Your table is stunning. I showed it to my husband and want him to make me a box such as yours. You are a beautiful stylist! I'm going to follow along to keep up with what you have going on! Blessings to you for a wonderful Christmas. I can't wait to duplicate what you have done here! I can't stop looking at it!! !